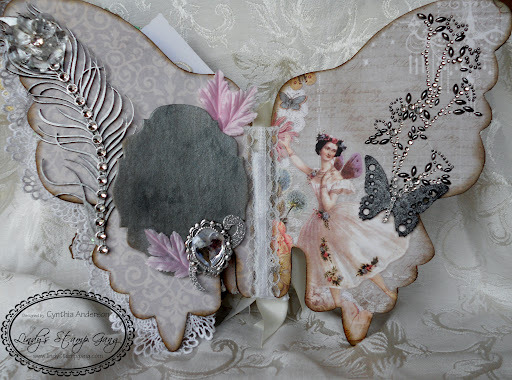 Lindy’s Stamp Gang "Fantastic Designer Friday"
I used the Butterfly Album available @ Lindy’s Stamp Gang. 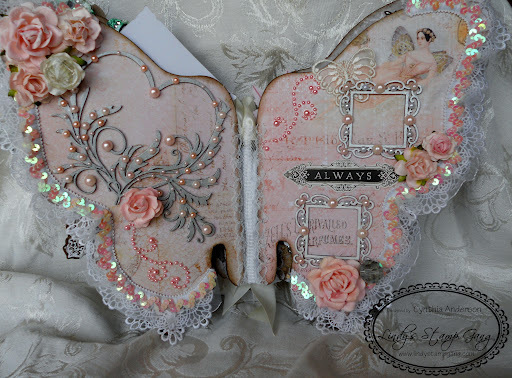 I also used Prima Fairy Belle paper collection and misc lazer die-cuts, Starbursts, Glitz, I Am Roses flowers, and embellishments. I titled this album Wonder. I bound this album with lace using my lace binding technique. 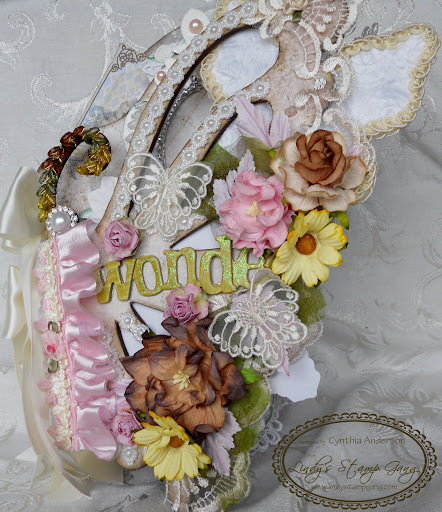 For the cover I used lace, flowers, butterfly appliques, and leaves. 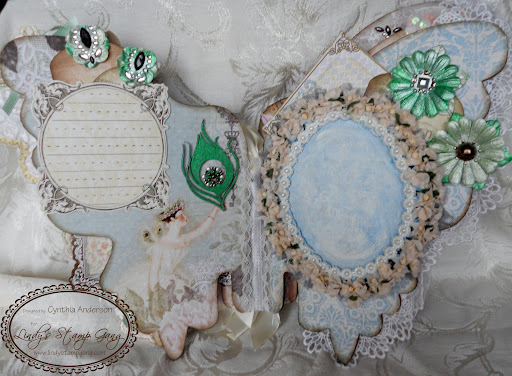 The first pages have a frame, a journal spot sprayed with Scintillating Silver Glitz Spritz, and a butterfly embellishment I made from rosette trim, fancy trim, pearls, and sprays. If you look very closely behind the fairy she has some beautiful peacock feathers so I had to use the Peacock Feathers die-cut, I used a beautiful green to paint some of the accents. There is a photo mat and a journal spot on these pages as well. Behind the journal spot and photo mat are tags that pull out. These are my favorite pages. 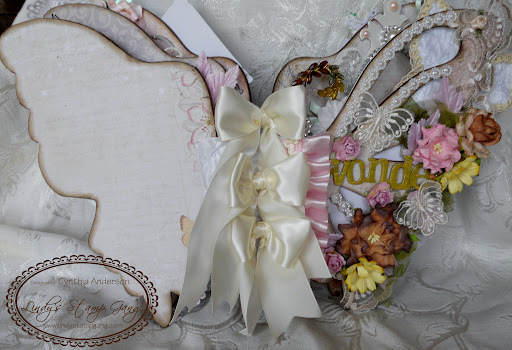 I used the Heart Flourish and embellished it with some beautiful pearls. 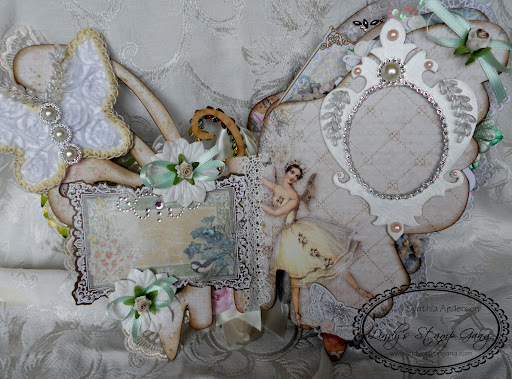 I also used some beautiful lazer die-cut frames embellished with pearls. I used some Roses colored with Salt Water Taffy Starburst spray. The front and back covers. I added some beautiful bows on the spine for some frills. WOW!!! I can't even imagine making an album as fabulous as this one! 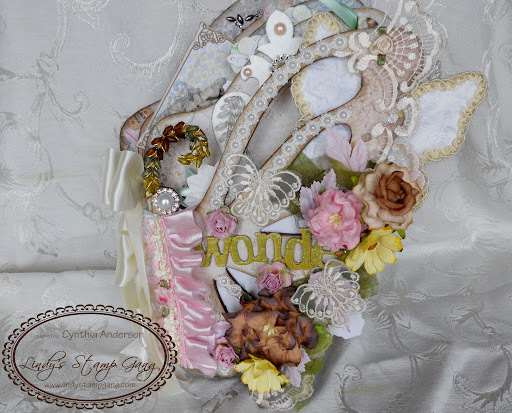 It really is stunning!You are such a fabulous and clever crafter! I truly admire your style!